Our model 3530CDLR is ideal for transporting very heavy unit loads. This heavy-duty chain-driven live roller is designed with heavy .300 wall steel rollers, larger size roller chain and heavy-duty structural frame and supports for applications demanding ultra-durable construction for longevity and durability. 3-1/2″ diameter x .300 wall steel rollers, model 297S with sprockets. 6” with No. 60 chain; 7-1/2” and 12” with No. 80 chain. Reversible drive either side mounted or underside mounted (specify). The main drive roller is supported by precision, heavy duty, lubricated, ball bearing units. The chain drive is completely enclosed along the entire length of the conveyor. 6” at 8.2 lbs. and 8” at 11.5 lbs. structural steel frame. Bed sections attached with couplings and floor supports. 3/4 HP, 230/460/3, 60 cycle, ODP right angle gear motor. Intermediate bed section lengths 3’-0”, 4’-0”, 5’-0”, 6’-0”, 7’-0”, 8’-0”, 9’-0” and 10’-0” increments. Minimum overall conveyor length with drive 5’-0”. Maximum overall conveyor length 80’-0”. 6’-10-1/2”, 7’-6”, 8’-1-1/2”, 8’-9”, 9’-4-1/2” and 10’-0”. 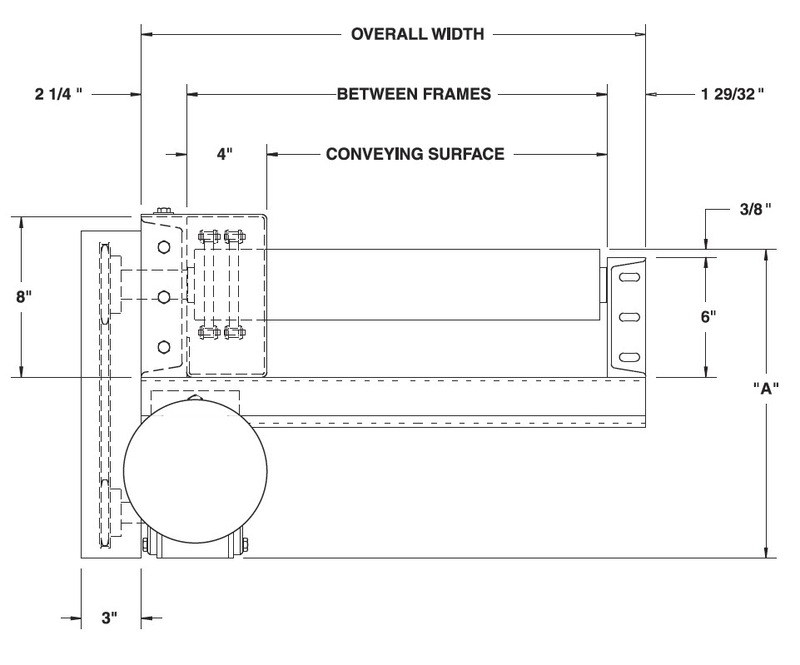 Minimum overall conveyor length with drive 5’-0”. Maximum overall conveyor length 80’-0”.